Commitment, loyalty, responsibility. These are all things that we want in ourselves and in those around us. Social scientists have long discussed how we live in a social world. We are not born into a social vacuum; rather our lives influence others, just as their lives influence ours. Think of a sports team—if a handful of team members consistently miss practice and lack commitment, the whole team suffers. This situation likewise exists in society. However, realizing the value of these virtues is not enough. To instill them in our hearts we must go back to where they are cultivated: the family unit. Threats to the natural family and its breakdown continue. One very strong force behind this seems to be related to the desire to have unlimited access to whatever we want – personal gratification. This quest for personal gratification has made us less patient as a whole and has led to feelings of entitlement. This self-centered mindset has both influenced and promoted cohabitation and abortion. Cohabitation has been on the rise for the past five decades with dramatic increase within the last decade. The National Marriage Project found that approximately 7.599 million couples are cohabiting in the United States. Cohabitation is on the rise with changing attitudes and acceptance of this alternative lifestyle. Abortion has been increasing as well. As early as the 1850’s abortions were performed and in 1957 abortion was recommended for legalization by The American Law Institute. But it was the 1973 Supreme Court decision, Roe v. Wade that fully legalized abortion and stamped it on the American psyche. Today in America, there are over 1.3 million unborn lives lost to abortion each year. Studies have also found that within cohabiting unions there is a lack of commitment, communication skills, and support. While marriage encourages individuals to look out for someone else, cohabitation encourages us to look out for ourselves, thus creating a world in which the main focus is “self. “ When adults choose to cohabit they are looking out for their personal interests rather than the interests of another human being. The same is also true of abortion. The harm to unborn children rises in cohabiting relationships. The percent of unintended pregnancies aborted by cohabiting couples is 39 percent compared to 22 percent for married couples. The leading reasons that a women chooses to get an abortion is because of interference with personal responsibilities, cannot afford the child, not wanting to be single parent, or troubles with their partner. People fail to realize that actions have consequences and part of being a competent adult is being able to deal with the consequences of their actions. Once someone has acted in a way to produce a child that individual has the obligation of caring for that child. Marriage has been called a “wealth generating institution.” Men in cohabiting unions have lower incomes than those who are married, and are less financially stable both when starting out and later on in the union. If the couple is married they are more likely to have the economic resources to provide for a child. When married the mother and child also receive commitment and support from the father. In The Wrong of Abortion the question of whether or not a fetus is a life is addressed. The authors Patrick Lee and Robert George ask “Are human embryos persons or not? People may stipulate different meanings for the word “person,” but we think it is clear that what we normally mean by the word “person” is that substantial entity that is referred to by personal pronouns”(p.16). Embryos are persons in the early stage of development, but they have just as much right to develop as a human does post birth. The most obvious victim of an abortion is the unborn child. At 18 days the fetus’s heart begins to beat, pumping its own blood. On day 28 after conception the fetus already has eyes, ears, and a tongue. Most abortions take place during the first 14 weeks of an unborn child’s life. When an abortion takes place the mother of the unborn child is also affected. Problems not only occur after the abortion, but there are risks in performing an abortion. According to the American College of Obstetricians and Gynecologists the following are risks during abortion: incomplete abortion, infection, hemorrhage, damage to uterus, and death. Eight-three percent of women who get an abortion are unmarried; this includes those in cohabiting unions. 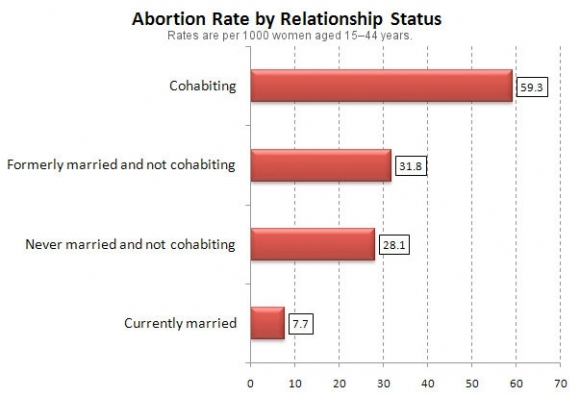 Married women are significantly less likely to choose to have an abortion. Many women who have an abortion do so because they feel pressure rather than support from their family and friends. Many people in support of abortion say that the individual should have the right to do whatever they want with their body and life. Once again they are looking at life through the lens of the individual instead of the lens of the unborn child and of society as a whole. Our individualistic society is becoming more self-absorbed and even more so as we break apart the basic unit of society —the natural family. Although there is growing acceptance of cohabitation and abortion and while we need to treat everyone with respect, we need to keep our focus on what will be the most beneficial for children and for society. What is most beneficial are married mother/father families where children are welcomed, cared for, and reared to be happy and productive citizens. Tashica Jacobson is a senior Marriage and Family studies major at Brigham Young University-Idaho. She comes from a large family with eight siblings, of which she is the second oldest. She grew up in Idaho and loves it. Tawny Tanner is Graduating with her Bachelors of Science Degree in Communication. She has 3 siblings and grew up in Utah. Tawny loves the outdoors and enjoys spending time with her family. Fagan, P. F., & Johnson, K. A. (2002). Marriage: the safest place for women and children. The Heritage Foundation. Finer, L.B.,& Zolna, M. R. (2011). Unintended pregnancy in the United States incidence and disparities. Contraception.84(5). 478-485. Frequently asked questions, American College of Obstetricians and Gynecologists, October 2011. Infoplease. (2007). Abortion in the united states. Pearson Education Inc.
Know Learn and Share the Facts about life, Prolife Across America, 2013.National Marriage Project. (2012). The state of our unions: marriage in america 2012.
abortion/cohabitation connection, Should we live together?